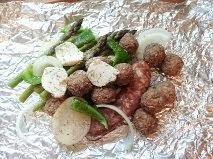 Do you remember grilling your dinner in a foil packet as a child? Maybe at a scout camp out or with your family? I grew up camping in the Rocky Mountains of Colorado. Foil dinners were a staple. In summer, I like to set it up as a "Bar" where everyone can choose what they want. (But at least one veggie item besides the potatoes is must). In fall/winter: I like to have them premade and ready to just pop into either my oven or even my crockpot. to cook while I work. If you've tried and failed before It may have been that your potatoes weren't cooked all the way, or maybe the meat was undercooked, while the vegetables were overcooked. Let me talk you through how to make it more successful, so your family can have a fun and yummy meal. Potatoes: Raw: The trick is to slice them very thinly and evenly. I use a Mandolin slicer on it's thinnest setting. If you want to use potato chunks, I suggest pre cooking them for a few minutes in a microwave to speed up the cooking. This is not necessary however if you stick to thin slices. Canned: Any shape of canned potatoes will work since they are precooked. Meats: Raw: If you want to use raw hamburger, or chicken: consider crumbling/dicing it rather than a solid patty, it will cook through much easier. If you want to use a brat or hamburger patty see my tip below. 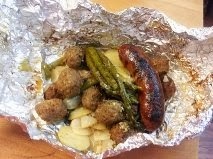 Precooked: Meatballs, hot dogs and Kielbasas are kid friendly and precooked so you are heating up the dinner rather than worrying if it is raw in the middle. 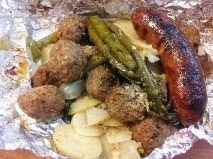 Meatballs are my favorite. 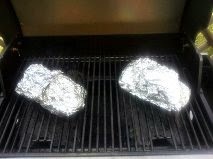 Foil sheets: Spray the side that will be touching the food with non stick cooking spray. Layer the raw vegetables first. Layer the raw meats next. Next layer any cooked meats followed by any canned vegetables. Add 2 Tablespoons butter or margarine on top. Gently pull the sides of the foil up slightly, pour about an 1/8 cup water over top of food. (this will help steam/cook the vegetables). 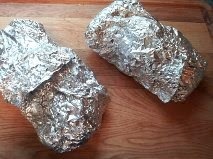 Pull up the sides of the foil pack and roll /fold over to seal: Creating a pouch. For Oven: Bake at 375° cooking times will vary depending on raw meats vs precooked (such as meatballs, etc) but start with 30 minutes and then open and check on meats. cook till meats are thoroughly cooked through. For Crockpot: Place packets in slowcooker and cook on high 4 -5 hours till meats are cooked through. Open one packet and check to see if raw vegetables are cooked through. If you used raw meats such as full hamburger patties, brats or chicken in your packets see tip below to ensure fully cooked. JANS TIP FOR RAW MEATS: After removing the packets with the fully cooked vegetables) from the grill, open them up and remove the meat (The brats, burgers, chicken) that are not completely cooked through and place them directly on grill for 1-2 more minutes to finishing cooking all the way through to safe internal temperatures. You can make a little gravy to pour over your packet dinners if you'd like, that always tastes great!